Of course it's using MAGIC to do so - the magic of magnetic repulsion and attraction that is. The Levitron is a magnetic anti-gravity top that is just as fun to setup as it is to watch in motion. Basically, you just use the included top weights to adjust to the perfect weight (which varies from location to location and surface to surface), then you adjust the legs on the base. Then spin the top, slowly lift the lifter (with top on it) until the top escapes the platform and release! Voila. 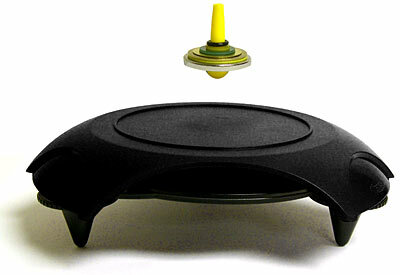 A top levitating in mid air. And depending on how well you set it up, it will spin up to five full minutes! Wave your hand underneath (or anything non-metallic), and amaze your family and co-workers! And all this with no batteries - sheer magnetic wizardry! Of course it is not a piece of cake to setup. You have to observe it carefully as you are making the appropriate adjustments to the weight and to the base. It can be challenging but the reward is well worth it. Move the Levitron to another location though and you'll have to recalibrate the weights and levelers! Take the challenge and master it. It may take you five minutes, it may take longer. Note: The Cherry Wood Edition is no longer available. Sorry! Because of the high strength of the magnet in the base (and that it is purposely not shielded), ThinkGeek recommends you do not set the Levitron next to your monitor! Duh.